Imagine cruising down the road while staying in touch with your friends and the rest of the world through your favorite social media sites. Or listening to your favorite online radio stations and podcasts, while checking out traffic interactively — how cool would that be? Sounds like the future? 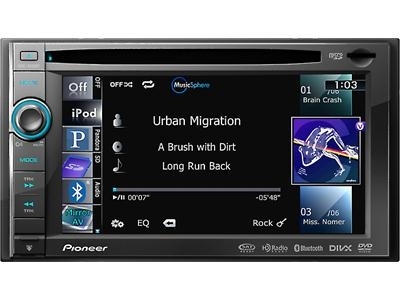 Not quite — the future is now with Pioneer's AVIC-X930BT navigation receiver. It works with your iPhone® to make all this possible while you're in the car. You can stay connected, stay entertained, and stay informed almost anywhere you roam. With the free Aha Radio app and your iPhone, the AVIC-930BT will let you tap into a wide variety of personalized, on-demand content while you're behind the wheel. 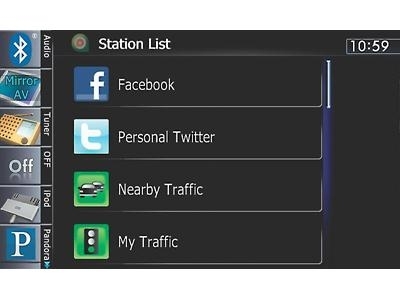 Aha Radio provides audio streams of information like status updates and Tweets, so you can catch social media updates from Facebook and Twitter while you drive, without having to check out your iPhone's screen. If you need a bite to eat or a cup of coffee, listen to search results and reviews of restaurants and coffee shops listed on Yelp with Aha Radio's "Hungry" and "Coffee" stations. Aha Radio filters, sorts, and prioritizes the content you get based on your location, so you can even tap into traffic info for first-hand reports of road conditions in your vicinity. And the flow of information doesn't stop there. Aha Radio has news updates, podcasts, and even comedy — so there's always something to listen to. Into PANDORA®? When your iPhone's connected you'll have control of your stations from the receiver's touchscreen, including "thumbs up" and "thumbs down" song ratings. And you'll see album art, plus song and artist info as well. If you're into moving pictures, plug in your iPhone with Pioneer's iPod cable, and you'll be able to watch YouTube, Netflix, and other online video content when you're parked, or send it to backseat monitors while you're driving. Thanks to dual-zone A/V control, you can even listen to music from another source while the crew in the back enjoys video. The AVIC-X930BT guides you with detailed Tele Atlas® maps of Canada, Puerto Rico, and the entire U.S.A. Whether you're looking for a gas station or your favorite coffee shop, you'll find over 12 million points-of-interest to help you find the services you need when traveling. The system's text-to-speech function announces street names as you go, so you'll always know you're making the correct turn. If you've ever been caught in the wrong lane at a busy interchange, you'll appreciate the Lane Guidance feature telling you which lane to be in for an upcoming turn. And Pioneer's AVIC FEEDS add a whole new level of fun and functionality to your navigation experience. You can use AVIC FEEDS with your iPhone to transfer destinations from Google Maps, download points-of-interest from the Internet, and more. The ECO Graphs function even lets you keep track of your carbon emissions and gas mileage when you're taking a trip. You can make hands-free calls easily with your compatible phone, and the built-in Bluetooth also supports audio music streaming (A2DP) so you can stream music wirelessly from compatible mobile devices to the receiver. In most vehicles, you can use this adapter to connect your vehicle's steering wheel controls to this Pioneer stereo. Connect a few wires, then program the adapter for your particular car and the Pioneer, and you'll retain the convenience of your steering wheel controls. iPod note: If you're going to use your iPod with this receiver, be sure to check Hands-on Research for specific iPod model compatibility with this receiver or its optional iPod adapter.